Here’s a track that I have had on “draft” status for a week. 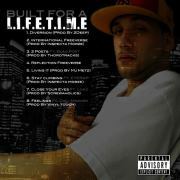 I could not find some decent artwork for this joint so I compromised by using LIFETIME’s twitter pic. At any rate this joint is nice, and hey, it features Sha Stimuli. You can’t gow wrong with that. This cut comes off of Rute Juxx’s album, Adamantine. The album really goes hard and relentless. Music to body people by.